Yosemite RV Camping Made Easy! If you didn’t jump on your computer at the stroke of 7am exactly 5 months ahead of the time you wanted to book your Yosemite RV Camping trip, don’t get discouraged. You can still experience this gorgeous park by day while enjoying a peaceful and scenic campsite by night. How? Consider camping just outside the park which makes RV Camping and experiencing Yosemite easy. 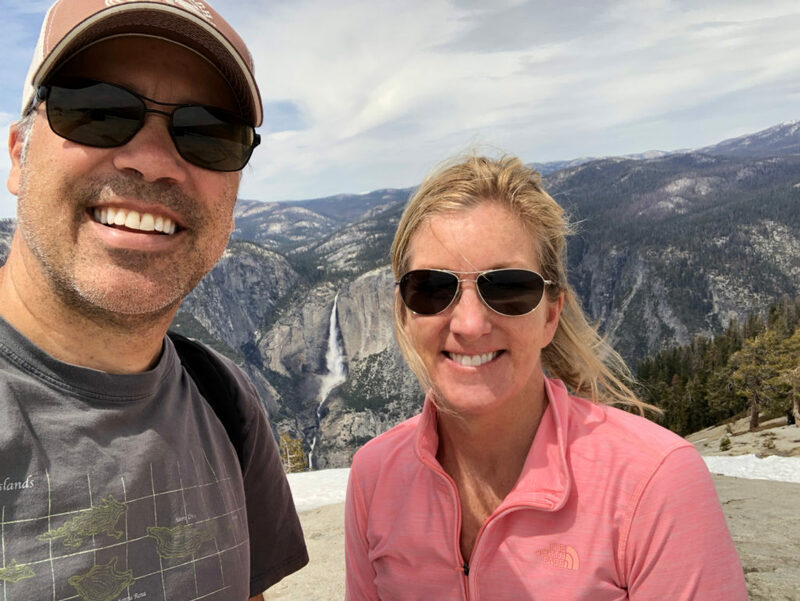 Last Thursday, Todd and I decided we wanted to get out of the San Diego area and take an RV for a long weekend to visit Yosemite. 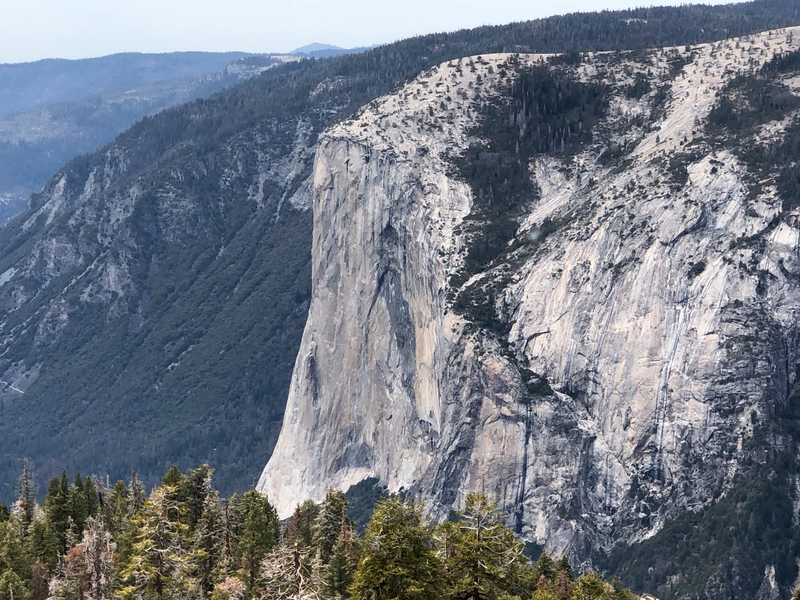 Spontaneous and Yosemite are rarely used in the same sentence, but we did it and here’s how. 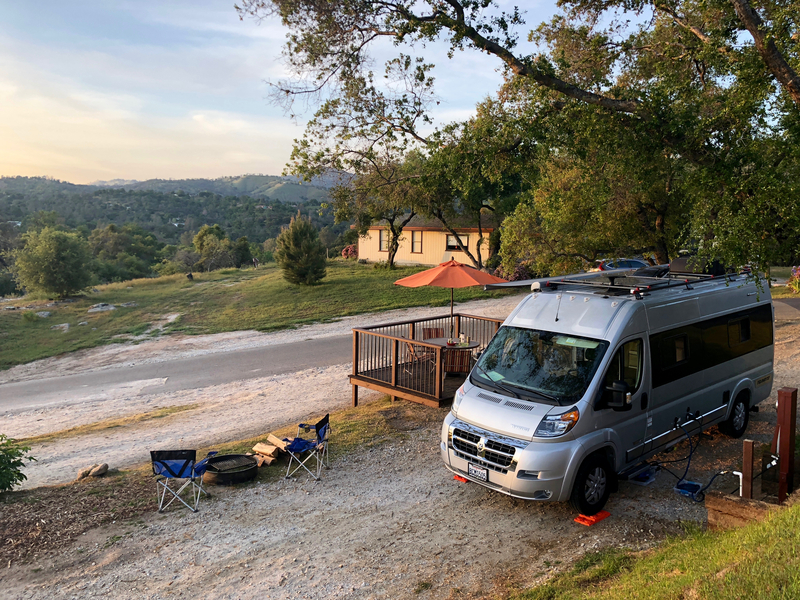 With our rig packed the night before, we left Encinitas and headed off to the Yosemite RV Resort in Coarsegold, CA, which sits less than an hour (about 25 miles) outside of Yosemite’s south entrance. Knowing how unpredictable LA traffic can be, we planned on 6-hours of travel which included some stops along the way. 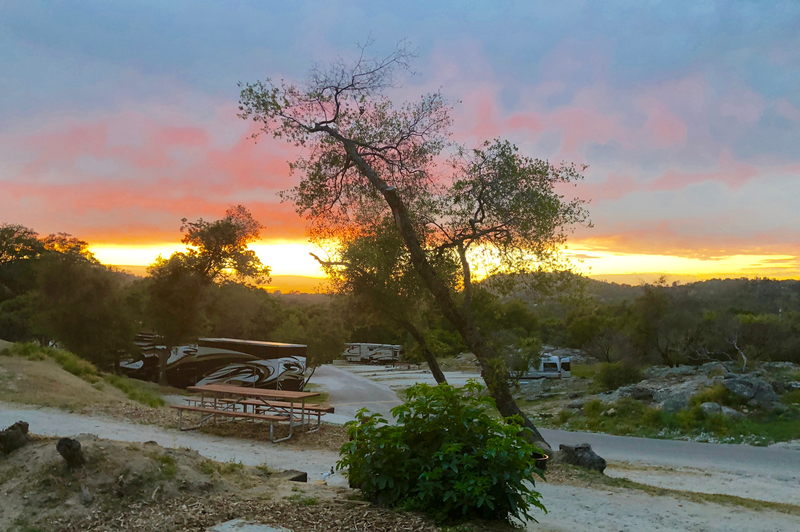 We pulled into Yosemite RV Resort (YRR) and scored site #17 which had its own deck complete with chairs, umbrella, fire pit, hookups, internet and a world class view of the Sierra Foot Hills. The weather was ideal ~ 75 by day / 55 at night with just enough breeze to be comfortable. Over our fire-side dinner, we plotted our next day of hiking in the Park and decided on Glacier Point, known for panoramic views of Yosemite’s most iconic peaks. It was such a beautiful morning that we took our time preparing a good breakfast accompanied by coffee and latte’s (yes latte’s which are easy with this favorite travel companion!). By the time we got our hiking gear on, our daypack prepped with lunch, snacks and water – it was already 10am. 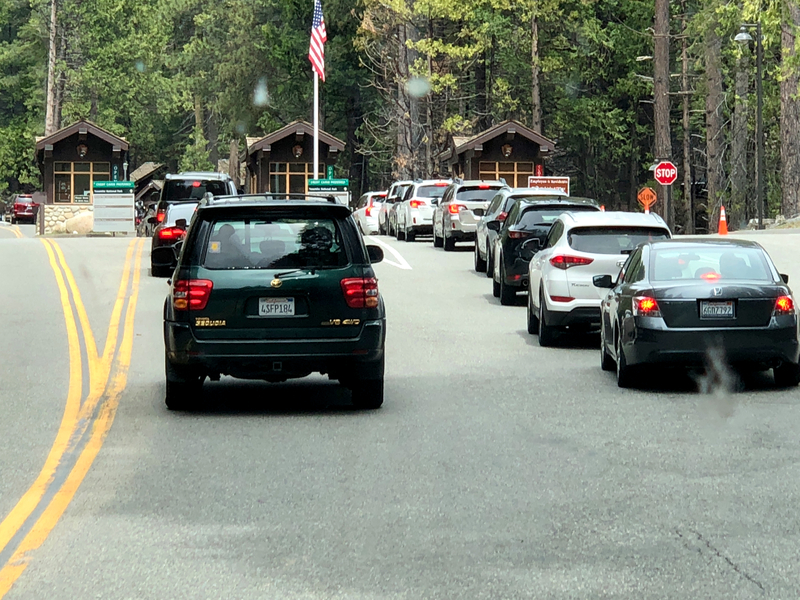 Our slow start didn’t seem like a big deal until we got about 1.5 miles outside of Yosemite’s south entrance where the traffic came to a complete stop. We crept along in line for about 30 minutes until we reached the park entrance. Once in the park it was smooth sailing to Glacier Point which took about an hour. Our site in Coarsegold relative to Yosemite and surrounding area. Tips: Get up early and on the road no later than 8a if possible. Have your annual National Park Pass in hand to assure you get thru the entrance without delays. NOTE: The smaller the RV the better to navigate the windy road up to Glacier Point where there is a 30ft RV limit. You can also rent a car for the day and leave your RV at campsite (see end of this blog for options). South Entrance of Yosemite National Park. Use any lane except employee entrance. 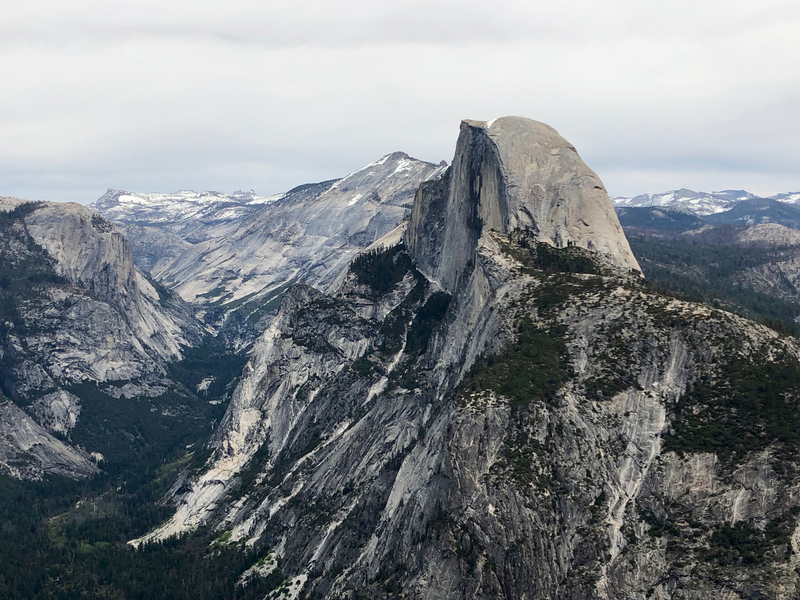 A clear view of beautiful Half Dome along Glacier Point Road. Amazing! 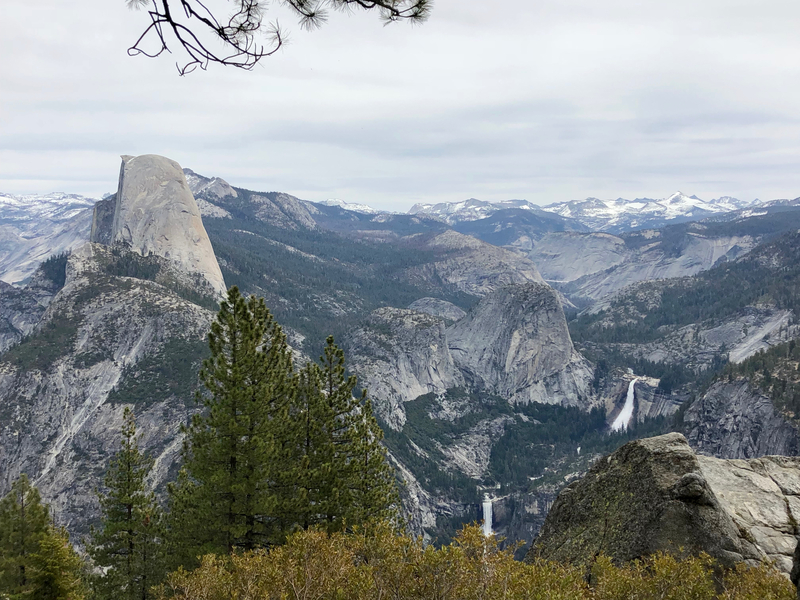 Once parked in the lot at Glacier Point, we joined the many other Park visitors to take in the incredible views and snap some photos. 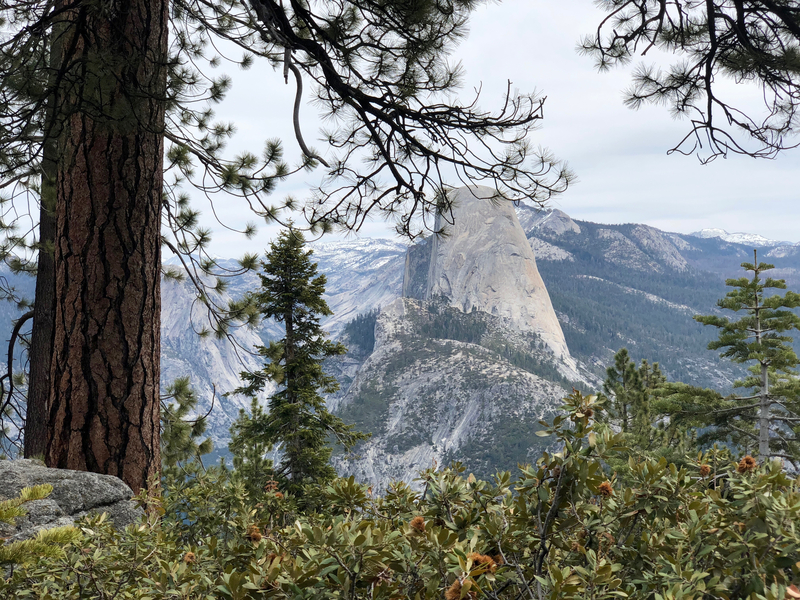 We hit the trial to Sentinel Dome which round-trip was ~ 4miles with 900 feet of elevation gain. This was not a technical hike and a nice alternative if you’re not up for the big all day hike up to Half Dome. We spent about an hour at the top of Sentinel Dome taking in the 360 degree views which were incredible. 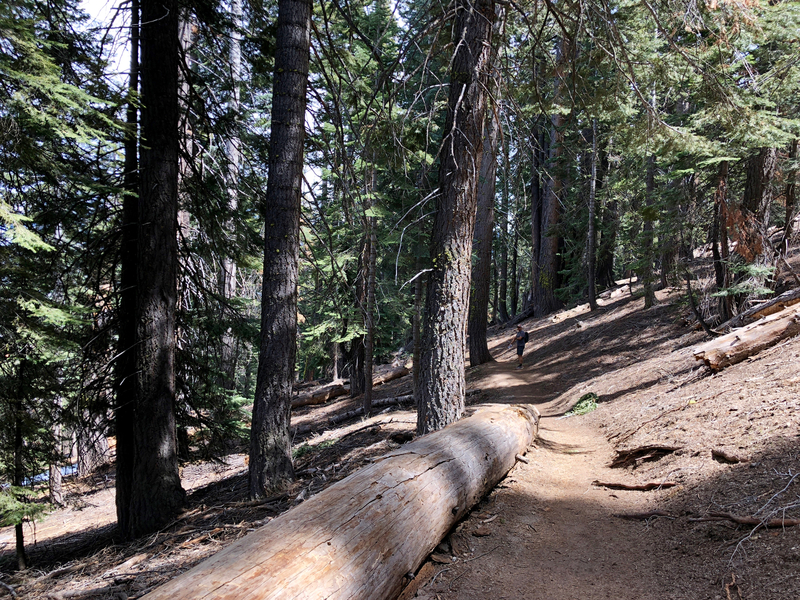 All in all, this hike has huge scenic payoffs relative to the amount of hiking time required to get there. This is ideal for when you’re short on time and/or if members of your group are not up for big miles. At 3:00p we started heading back to our site in Coarsegold and experienced no traffic at all. We made a stop in Wawona to check out the historic hotel, then again in Oakhurst to stock up on dinner supplies. We arrived at camp around 5:30 and road our bikes over to the free showers which were super clean, had great water pressure and plenty of hot water. Afterwards, we settled in for a great evening complete with yet another world class sunset. 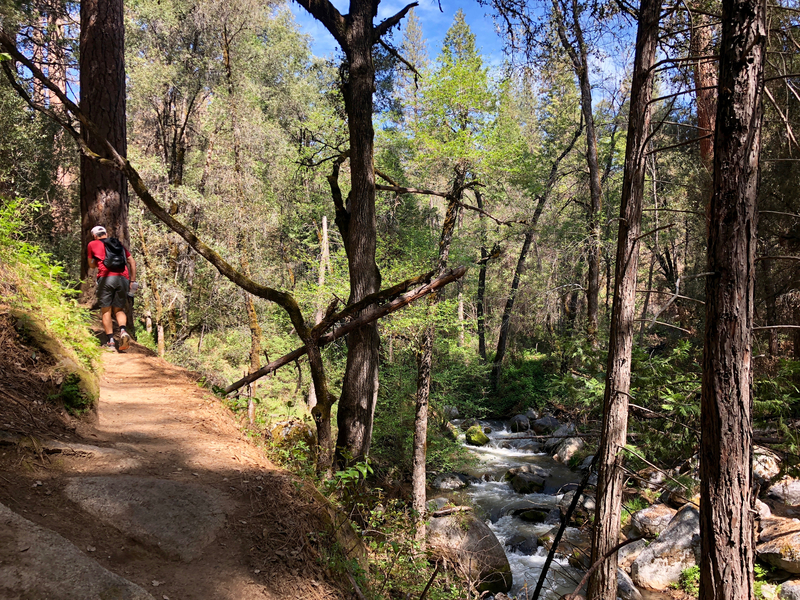 Today we wanted to do some hiking a little closer to camp so we decided to drive about 15 minutes north to check out the Lewis Creek Trail just outside of Oakhurst. 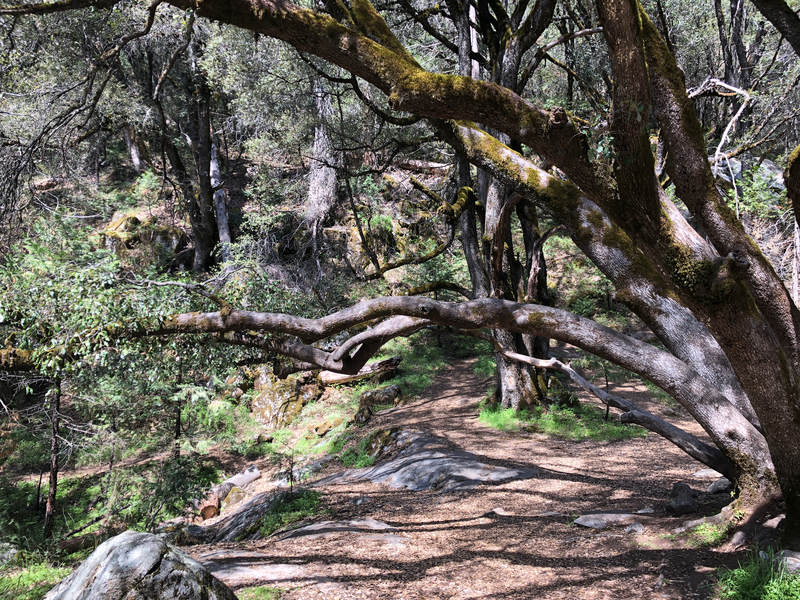 This easy-going 5.5 mile (round-trip) hike winds along a pretty stream with the destination being Corlley and Red Rock Falls. This was just the right amount of nature and activity of get us in a happy frame of mind to make the drive back home post a fantastic weekend! Travel Suggestion before you head out. * Offer limited and available during May only. Excludes Memorial Day weekend and diesel models. 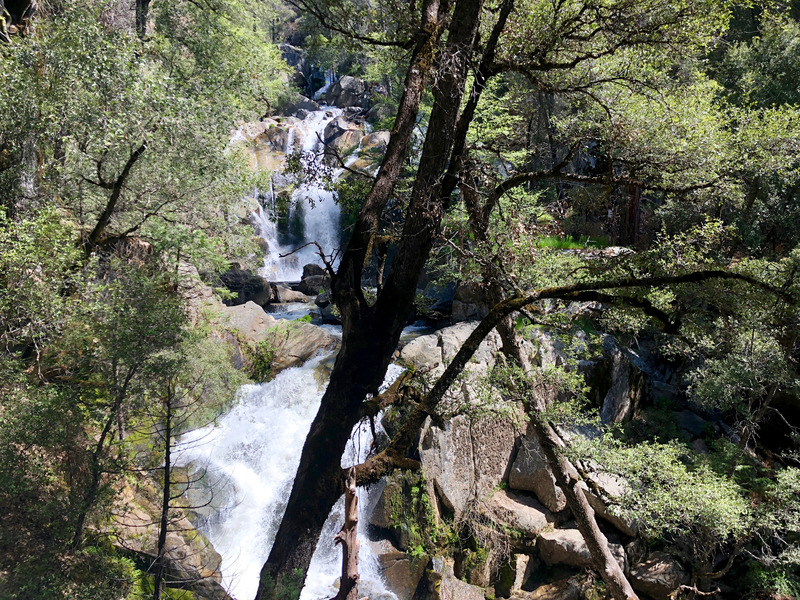 Renting a car from HERTZ in Oakhurst, CA (559-692-2277) can be a nice alternative to driving your RV into the park. They offer 5 passenger cars (and larger vans with a day or two notice) for about $30-$50 dollars per day. Hours are 8:30a-4:40p and they’ll come to YRR and pick your group up, bring you to their office and off you go. 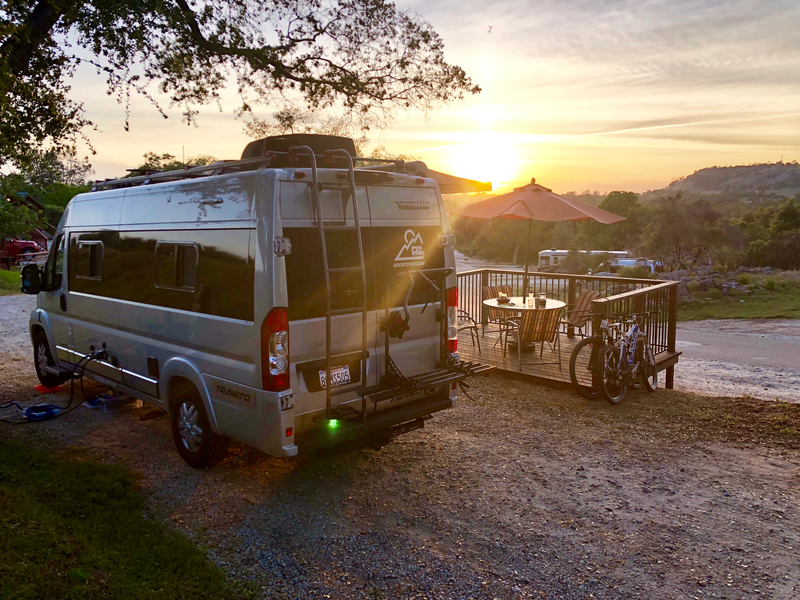 Having a car vs. an RV can allow you to be a bit more nimble in the park while also letting you to leave your campsite intact for when you return from a long day of hiking. 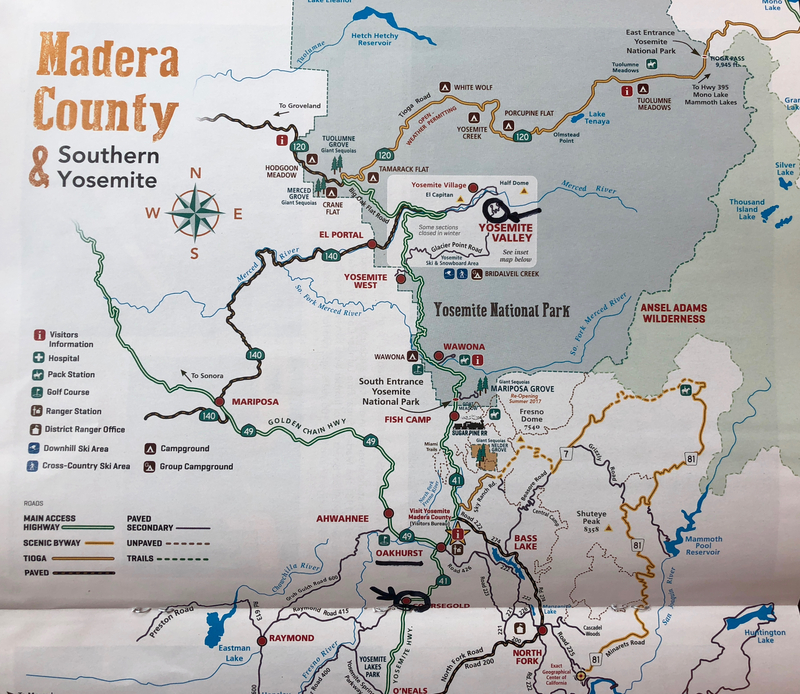 YARTS (Yosemite Area Reginal Transportation System ) is a public transit in the Yosemite region, with buses entering Yosemite Valley from a variety of locations, including one about a ¼ mile from the YRR @ the Coarsegold stop. There is parking at the stop it you drive there whereas walking isn’t very safe on the main road.